Good morning! I hope this fine Friday is treatin' ya well! I've got a card to share with you today that was inspired by one of my recent trips to town. Around here, since we live in the country, a trip to go to any sort of store, is "a trip to town". City folk always laugh at that statement, but when you live in the country, it is what it is, and we "go to town". It is kinda funny when you think about it. Anyway, the other day when I was "in town", I happened to notice that every farm store I passed (and there are a lot of them, BTW) had a banner out front that said "Chick Days". Well, in the city, I'm sure that banner could have an entirely different meaning, but here in the country, that means these stores have live baby chicks for sale. You can hear the cheeping and peeping as soon as you walk through the door, and those little chicks are so fuzzy and cute, which made me think of this Cottage Impressions stamp. Chick days have arrived for this mother hen, too!! I used a new paper stack from Kaiser Craft called Nan's Favourites Collection, and as well as the pretty patterned paper, it had the cute little die cut piece. that I put at the bottom of this card. Hmmmm... I wonder if our friends at The Scrapping Cottage could hook us up with some dies to cut fancy edges like that? I'd LOVE to have some of those!! This Hen and Chick's image was stamped with Memento tuxedo black ink and colored with my Copics, and the sentiment comes from Peachy Keen Stamps Sweetie Pie Peepers stamp set. For embellishment, I used this pretty daffodil colored ribbon, and tie it with a cute little flower button. I'm so glad you could drop by today!! I wish you a blessed and wonderful weekend and as always, happy stamping! P.S. 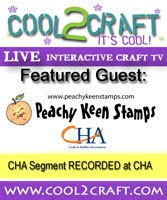 - Don't forget tonight is release night at Peachy Keen Stamps. All the new releases will go on sale at 7:00 p.m., and all of the sneak peeks you've seen this week will be revealed in our blog hop! You're not going to want to miss this, so I'll see you at 7:00!!!! Baby Chicks in town!! CA-UUUUUUTE! What a neat place to live...and visit, when can I come? :) Adorable card, Lorie-dear! Have a great weekend! I would love to give this card to my grandmother. This country girl knows exactly what it means to "go to town", and I know about chick days too.